When I arrived in to the track in Castleisland I was surprised by how well it looked. I hadn’t heard that it had been resurfaced and had been expecting it to be as hard as the CIT. I was also glad that it was an overcast day as there is no stand and it would have be hard to find shelter from a baking hot sun. I had made a decision not to arrive there until approx. 1pm as my 1500 event was the last on the programme. I spent the time relaxing on the grass watching the other Eagles in their events. Eventually as my event drew closer I headed out to do a warm up on a gravel path that runs around the Castleisland Track Complex. Soon we were called for the 1500 events. Checking the entry list on Friday there was just four entered in the O/60 category. 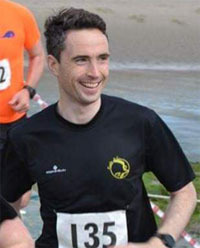 On the start line I was surprised to discover there was only one other O/60 Michael Quinlivan from Tulla AC taking part. When the gun went I tucked in behind him straight away. My tactic was to hang on to him until the final lap and to try and outsprint him then. Going through 400M I felt comfortable, 600M I could hear him breathing heavy. Change of tactics then I decided to go past him and just focussed on trying to catch the next runner up ahead. 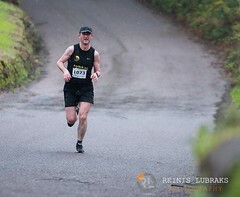 From there on I just ran as hard as I could and was delighted with my time in the end. The track in Castleisland was a joy to run on compared to CIT. 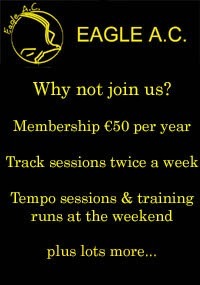 For me the Munster Masters track championships was fun. I had been in Castleisland the day before as the juveniles were competing so I got a good feel for the place. Pat should have told us to bring our folding chairs as the only place to settle was along the grass embankment, now know for the next time!! An Riocht have great facilities with a track which as only resurfaced last year. Eugene and I were first to arrive on Sunday morning as we had stayed over on the Saturday night. The first laugh we had was when Neil, Tom and Ken arrived having travelled together. The boys all thought they were thoroughbreds as they headed for the races at the horse racing track instead of An Riocht!! Wonder who would have won that 7 furlong race. We settled ourselves on the embankment watching some of the field events. There was masters men javelin taking place where it was clear to see the athletes of old. They may not have had the pace for the run up but they still had the technique! Can’t say the same for the masters men high jump as I’d say some of them can’t walk today from the way they landed on the bar!!! All part of the fun. What was great to see was how everyone supported each other and gave great encouragement. Time passed quickly enough as we waited for the track races to start. My nerves started to kick in as I was going to try the 800m race for the first time. I needed to get one race out of the way. We got called to check in for our race. 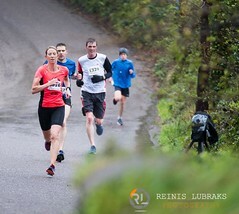 Thankfully they separated the senior women from the masters. We watched Stephanie Cotter of West Muskerry put on a great performance before she heads to the States on a scholarship. While we were checking in, we were also checking out the opposition, listening for others in our age group. We were called to the line and it all kicked off. 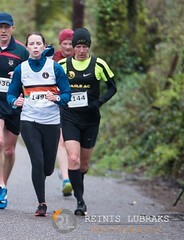 I gave my best and was delighted with the support I got from my Eagle team mates as I ran past them. It was a very humid day which you certainly felt as the race went on. 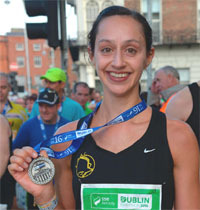 I got my first individual Munster medal – bronze. Pressure was off! 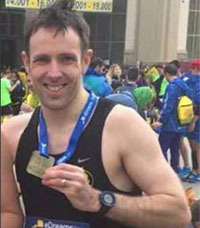 Next up was Neil who put in a fabulous performance to get his first medal – gold! Pressure was now on the half century and over boys!! Tom and Eugene did brilliantly in what was a very competitive over 50 field and did Eagle proud finishing 5th and 6th.The next thing to decide was whether to eat anything or not! Neil was in favour of milk while Ken was adamant about the ambrosia creamed rice, looks like the sandwich was going to have to wait as I passed round the Jaffa cakes and jellies!Neil had done his homework in relation to who everyone’s opposition was as he went to the trouble of printing out the list showing who had entered and for what race. I had to decide between the 3000, 400 or 1500 race. 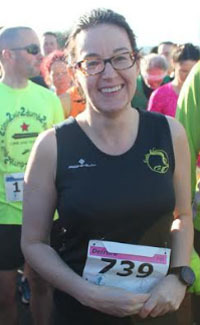 My hamstring was acting up so I was only going to do one more race. I chose the 3000m which looking back now probably wasn’t the wisest as I limped off. But what a race to be a part of. 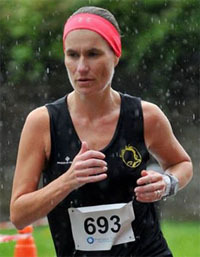 Shona Heaslip of An Riocht put on a real show to finish in 9 mins 19 seconds. My battle was to stay out of last position as I could see my boys cringing, unfortunately the master and senior women were in the same race! I managed it to get my second medal – silver this time. No more races for me. Straight to the ambulance for an ice pack! Next up for Eagle was Tom Fox in the 3000m. Tom put in a great performance to get his 1st bronze medal almost catching his opposition on the line.Pat Murphy was sitting nice and patiently waiting for the 1500, his only race of the day. 400’s up next and Eugene was the only brave Eagle to give it a go and finish in a very credible 4th. I still had the bragging rights in the O’Connor house! Finally the 1500 were on. Neil was first up and stormed home in the last 200 for his 2nd medal of the day – bronze.Tom was next and knew who he had to beat which he did brilliantly to get his second bronze of the day. Pat and Ken took their places on the line and proved that they are still tough to beat as they took home gold and silver. 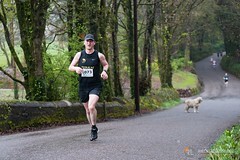 Pat even ran faster than he had in Cork. Must have been the Jaffa cakes! All in all a very successful day for Eagle but a great day spent with club mates. I found that we got great support from other Cork clubs also which we also reciprocated. Not sure if Ken got his candyfloss and chips on the way home, he might let us know!!! Track and field championships are worth a try for anyone who hasn’t tried it before. Someone mentioned the All Ireland’s as we were leaving……hmmmm! I enclose some memories of the Craggyisland ..sorry I mean the Castleisland event. Loads of pre-race banter on ‘track racing’ tactics, race selection and our likely competitors. Great club spirit and much fun, cheering on one another on from our grassy knoll above the track. Most of our small band of six were ‘rookie track runners’ but we gave it a really good shot and came away with nine medals. Overall, a super day out and thoroughly recommend this event to our fellow club members. I was competing in the M45 800m which was scheduled for around noon, and the M45 1500m which was expected around 3.30pm. As it turned out the 800m took place shortly before 1pm and the 1500m race was around 4.30pm. So it required a little flexibility in terms of warmups, recovery, nutrition, etc. There was no shortage of entertainment though as throughout the day there was either a fellow clubmate or other Cork athlete participating in an event so plenty to watch and cheer on. At one point we had to dispatch a search party for Tom who was missing in action and was in danger of missing his 3k (so really he owes his bronze medal from that race to me for finding him). The senior championships were on at the same time so some well known names were there, we had the pleasure of seeing national cross country champion Shona Heaslip gliding effortlessly around the track in the senior ladies 3k. Seeing masters track legend Joe Gough set a national M65 400m record was the kind of inspiring experience you don’t have every day. Seeing my Eagle clubmates one after the other making their way to the track and grinding out the results made it all seem like business as usual. 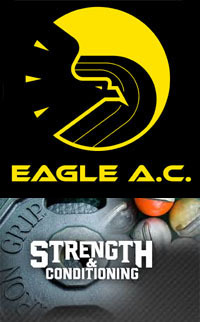 There was great support and camaraderie amongst the Eagle crew who were all camped together at our trackside base, and that helps as you need to be relaxed in order to perform at your best. By lunchtime I had fulfilled my main objective of the day which was winning the 800m and setting a PB (2:16.9). I had only run one 800m in a graded league race 2 weeks before in a time of 2:22.7 so as a complete novice I was delighted with this. The 1500m came later in the day and while I think I had done what I could to mitigate the effects of the 800m, from what I’ve read and heard, doubling is always a precarious challenge. The first lap went well but my legs felt weak in the second and third laps and cautiously I slowed down, too much though and so my race plan had fallen apart by the time I passed the bell. I rallied and picked up for the last lap and I made sure to empty the tank to secure the bronze. Happy enough with the outcome but lots to learn. Next up for me on the track there will be another couple of graded league events in CIT over the summer which I hope to partake in, and if all goes well with my training I’d like to travel to Tullamore in August to test myself in the national championships, and hopefully there’ll be a few other Eagles there too. You learn something new about yourself from every race. As the bell sounded in the 800m Over 50s event I found out that I wasn’t an 800m runner since the injection of pace put in by the four ahead of me left me “going out the back”! I struggled home after that in 2.30 with the realisation dawning that today’s races were, to coin a phrase, “senior hurling”. There was a long wait for my next event, the 3,000m. 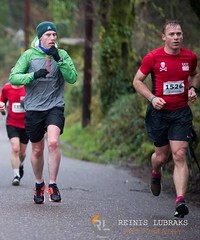 Time passed quickly enough between keeping an eye on other Eagle and Cork runners and Neil trying to run the legs off me with his short sprints to flush out the lactic acid. All age groups from M35 up were mixed in the single 3,000m race so I had no idea how many were in the Over 50s. 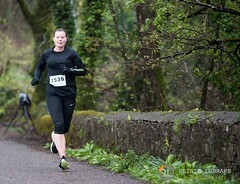 A lead group of 6/7 went away from the off and I took a steady pace (c1.25 per lap) from a Gneeveguilla (Kerry) runner. I stuck with him for 5 or so laps before he got away. 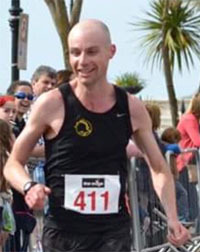 It was only long after the race ended that I found out I was third in the Category in10.22 and the Kerry runner ahead who finished second in the Category was also an Over 50. However even I had known he was “competition” during the race I don’t think I would have caught him. The 1,500m, which followed c75 minutes later was more straightforward. I found out at check-in that there were only 4 in total in the Over 50s. As hypoxia hadn’t yet set in (the race hadn’t started!) I knew what had to be done. The same two guys who won Gold and Silver in the 3,000m were also entered so the task was clear. Given that it was my third race of the day I ran reasonably well to finish in 5.02 for third. The support of fellow Eagles each time around the track was heartening and certainly created a team spirit. In the 3.000M ,the Eagles got to(had to!!) give me a shout on each of the 8 laps and that kept me going. Track running is certainly different from road running (there are no hills(!) and it’s more tactical) and is certainly worth a try. 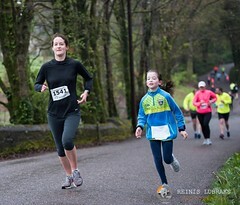 Check out the Graded Leagues events at CIT- the next one is on Monday, 25th June next. 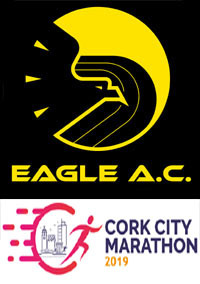 I have no doubt but that there are very many Eagles both fellas and gals who could successfully compete at both Cork County and Munster level. On arrival at Castleisland, I was very impressed with the An Riocht AC facility, there was nothing like this in Kerry when I was growing up in 1980s and running with Gneeveguilla AC. I selected 2 races, the 800m & 400m. 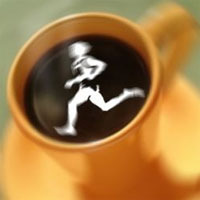 (Nothing to do with my perception of the competition over the longer distances!) The 800 was up early in the schedule and while I ran 5s faster than in the counties, it left me outside the medals in 6th place in a time of 2m35. There were some great races and battles during the day and Eagle had picked up 3 medals in the 800s with Neil, Ken & Adelle running great races. Further medals for Adelle, Pat, Neil, Tom & Ken followed over 1500m and 3000m. I was the last Eagle on the track for the 400m and tried hard to make it 10 medals for the club but had to settle for 4th in a time just under 70s. Overall it was a great day out with good banter, great entertainment and plenty support. 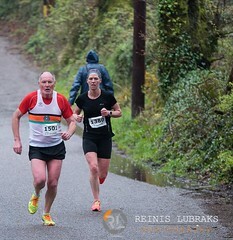 This entry was tagged 2018, Castleisland, Championships, Kerry, Masters, Munster, Track & Field. Bookmark the permalink.